My daughter struggled with identifying letters and matching them to sounds. She repeated Kindergarten twice to help her catch up on both reading and writing. During a parent/teacher conference, her teacher showed me her rendition of the alphabet. My daughter had stopped at the letter B and just drew faces in the boxes where each letter should have gone. I realized that she was avoiding the assignment because she couldn’t “see” the letters. They didn’t mean anything to her. By the end of her second year of Kindergarten, she hadn’t progressed in her reading or letter identification. Her teacher told me that she was doing “okay,” but every school day morning, she told me she didn’t want to go. Her stomach hurt. She felt frustrated all the time. That’s when I sought the help of Lindamood-Bell. Their comprehensive testing verified what I had been observing. She could hold two letters in her mind before they disappeared. She had trouble following instructions beyond two sequential steps. Lindamood-Bell suggested that she enroll in the Seeing Stars program. From the get-go, my seven-year-old daughter recognized that this program and the tutors were special. She arrived there ready to work and came home with a huge smile on her face. I asked her about her experience after each session. She’d reply with a “great,” “terrific,” “stupendous,” or “fun” every time. She loved the tutors and came home with stories of some fun activity they did during the sessions. What was most striking for me was to see her inner confidence blossom in the matter of a few short months. The first time she read a complete chapter book, she did a fist-pump in the air and cheered for herself on a job well done. After re-testing, my daughter can now hold five letters in her mind at a time. She gets excited for school and seems all-around more confident. 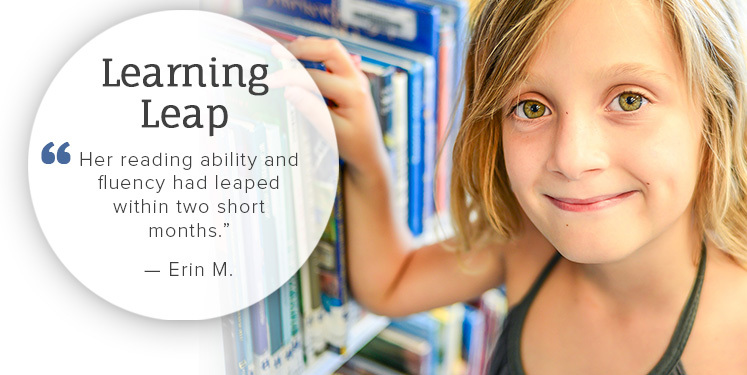 Her Ist-grade teacher was amazed at how her reading ability and fluency had leaped within two short months. Lindamood-Bell worked wonders for her reading and self-esteem. I’m so grateful that she had this experience. It’s amazing what the centers and staff can do with the Seeing Stars program!